We really have seen health benefits from our vegetarian diets. We get sick far less often, my husband lost weight, and we feel more energetic. Eating healthy most of the time gives us room for some tasty treats too! I immediately went to the soup section. It is January, by golly! And, I needed some recipes to use up our surplus of beets from the hoop house. I found a delicious sounding Roasted Beet and Garlic Soup. Jamie says this is a “A vegan soup with a smooth, velvet-like texture and beautiful, rich color.” I was sold! I also wanted to use the carrots that we are still pulling from the garden. 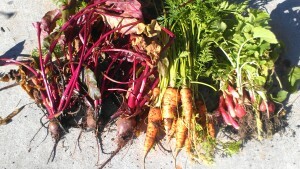 All of these root veggies—beets, carrots, and radish—were pulled on January 3 from our hoop house. You know, I really didn’t care for beets until this fall and winter. It is amazing what growing your own food can do for your taste buds. 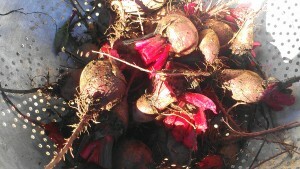 Recent beet harvest for this soup. Rub the beets with olive oil and place in a glass baking pan. Season with salt and pepper and cover pan tightly with foil. Cut the top off the head of garlic and place it on a foil square and drizzle with olive oil and sprinkle with salt and pepper. Wrap up tightly in the foil. In another pan, drizzle the carrots with a bit of olive oil and salt and pepper. Do not cover the carrots. Roast the carrots for about 20 minutes, the garlic for about 30 minutes and the beets for about an hour. If you are using smaller beets, try for 45 minutes. Have timers on the ready! Once the veggies are cool peel and quarter the beets and slice the carrots. Squeeze the roasted cloves out of the garlic. Add the beets, garlic, broth, thyme in a medium soup pot. Salt and pepper to taste. Bring to a boil and then reduce to simmer. Cook about 10-15 minutes. Add cream and puree in blender or using the immersion blender. I wish you could really see the color of this soup. It is beautiful! This is delicious and would have been perfect with a grilled cheese sandwich, just like tomato soup. hola sister! i’m so glad you turned to beets this winter. beets are the bomb! did i just say that? my apologies. also, very glad for your raspberrylove tequila drink!! i gobbled it right down. i was ONE ambitious lady 😉 xo! You are making me laugh out LOUD! This is a beautiful soup and I bet it tastes great. Just don’t tell them! They should love the color! Oh yum! I love this, and would have to add the leeks for sure because I’ve got them growing at my grocery store. hehe! Pinning! Aah, the magic grocery story garden! What a great looking soup! I love the bright color. I feel in love with roasted beets when I was a kid – sadly, if I were to make this soup someone else would have to roast the beets and prepare them because I would sit down and eat them until I was sick! When we were kids, the only beets we had were pickled. Wasn’t a big fan. Now I am. 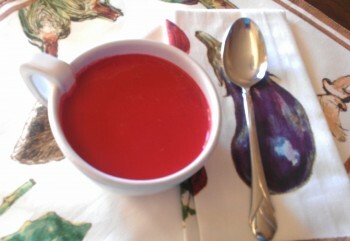 Beet soup is so good for you chock full of vitamins and minerals. What a great recipe pick for SRC. Great for us that are trying to be healthy in this new year. I think that is why I might be loving beets so much—because they are so good for you. What a beautiful color…I bet it is packed full of flavor! Yum! Loving this soup and especially how unique and fresh it is . Glad to be part of SRC with yoU! Loving the color on that fresh, yummy soup! I have to admit that I’m not a beet fan, but with the addition of the carrots and pleasing abundance of garlic, I think this is a soup I would love! So glad you shared this! Thanks! Seriously, if you were blindfolded, I bet you wouldn’t be able to tell there were beets in it! Wow—I really wish this picture did the color justice. I love beets but I have never made a soup out of them! The color is fantastic! I’ve never had beet soup but I do love them roasted! Oh, how I wish Connie liked soup… Alas, I have to eat the whole pot or hear him grumble… this looks like such a fun recipe! I am trying to think of a way you could disguise this. Nope, it is just soup. 🙁 Guess Connie won’t eat it. This is so gorgeous! And guess what? I’m a new group C-er!!! i want a hoop house!!!! what a great way to use up CSA beets right now 🙂 love it.